Maurizio Sarri has explained his decision to leave Eden Hazard out of his Europa League squad to face PAOK. Eden Hazard is not part of the Chelsea squad travelling to Greece to play PAOK in the Europa League on Thursday. David Luiz, Mateo Kovacic and Emerson Palmieri are also absent from Maurizio Sarri's 21-man squad. 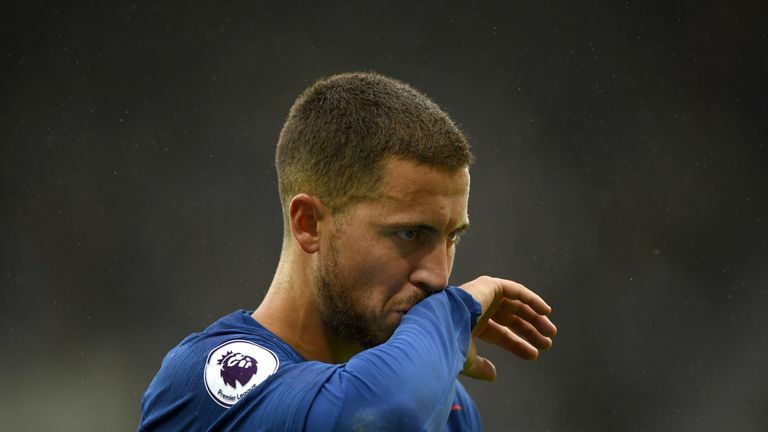 Chelsea boss Sarri said: "Eden Hazard, because he told me after the national team and the match against Cardiff he was a little bit tired, so I thought it was better to stay at Cobham, to have training and rest." Hazard has featured in all five of Chelsea's Premier League matches this season, scoring five goals as Sarri's side made a perfect start to the campaign. Sarri revealed Kovacic has a minor injury and added: "David Luiz is in Cobham, because he's playing very often now after six months without playing. And so I thought it was better for him to have training and rest." Chelsea have a run of three games in seven days, in which they face West Ham away, live on Sky Sports, before a Carabao Cup tie against Liverpool and a Premier League match against the same opponents three days later. Cesc Fabregas is included in the travelling party, despite having not featured in the league so far this season. Meanwhile, midfielder Danny Drinkwater has not been registered in the Europa League squad for the group stages, due to competition rules about the number of homegrown players that must be in the team. Ethan Ampadu, who signed a new five-year deal at the club on Wednesday, has been selected alongside fellow youth prospect Callum Hudson-Odoi. Kepa Arrizabalaga, Willy Caballero, Marcin Bulka, Toni Rudiger, Marcos Alonso, Cesc Fabregas, Jorginho, N'Golo Kante, Ross Barkley, Pedro, Ruben Loftus-Cheek, Victor Moses, Olivier Giroud, Callum Hudson-Odoi, Davide Zappacosta, Willian, Gary Cahill, Andreas Christensen, Cesar Azpilicueta, Alvaro Morata, Ethan Ampadu.